Home of the original flagship Radisson Hotel built in 1909, the sophisticatedly stylish Radisson Blu Minneapolis Downtown has been designed to interact with the buzz in the beating heart of downtown Minneapolis offering world-class, upper-upscale hospitality. A location sensation: where history and heritage meet contemporary innovation and culture. 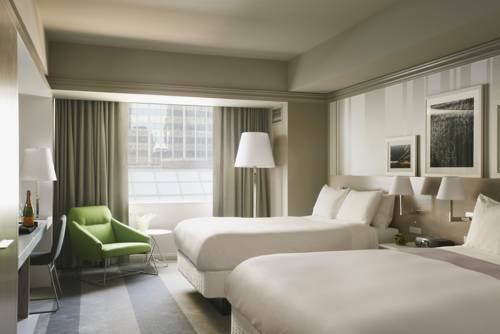 The Radisson Blu Minneapolis Downtown is conveniently situated just moments away from the vibrant theatre and business districts, shopping and entertainment all accessible to the climate-controlled skyway system. Plus enjoy a unique range of services and amenities without event leaving the hotel, including fast Free Internet, a 24-hour Business Center, stunning FireLake Grill house & Cocktail Bar and our state-of-the-art Fitness Center with amazing views of the skyline. FireLake Grill House and Cocktail Bar: Savor award-winning cuisine made from locally grown ingredients. Scandinavian Ballroom: 21,000 square feet of flexible meeting space, meeting space includes ballroom and boardrooms, catering-offering classic to creative cuisine, high speed internet access, audio visual services, and dedicated convention services staff. Minneapolis Convention CenterOur proximity to the Minneapolis Convention Center makes us perfect for guests attending conventions and conferences. MOA Field (Metrodome)While staying at this hotel near the Metrodome, catch an exciting Minnesota Vikings football game at this Minneapolis landmark. Target CenterWithin walking distance of our hotel, Target Center is the home of the Minnesota Timberwolves and hosts a variety of concerts and special programs. American Swedish InstituteHistoric museum offering a variety of programs designed to celebrate Swedish culture. Guthrie TheatreFounded in 1963, this local theater hosts performances of well-known plays each year. Mississippi MileThis charming riverfront district offers walking and biking trails and many historic sights to see. Mill City MuseumBuilt in 1880 as the world's largest flour mill, this museum is now a fascinating attraction for the whole family. Target FieldHome of the Minnesota Twins MLB team. Walker Art GalleryArt Museum with outdoor Scupture garden. Opened in 1927, this gallery displays works by modern artists, including Picasso. Metrodome (MOA Field)While staying at this hotel near the Metrodome, catch an exciting Minnesota Vikings football game at this Minneapolis landmark. Minnesota ZooGet up close and personal with all of the animals at the Minnesota Zoo. Warehouse DistrictJust a short walk from the hotel, this exciting area is full of restaurants, bars and nightlife.